Why is that you are not able to make any sense of things that you chose to do now? Why is that all your decision are just a 50/50 chance of getting right? I think the real reason for that is you can understand only make sense of your past not your future decisions. As humans we cannot make a good decision of our future all you can do is close your eye and think about all the variable that is there then write them down on a paper and make the best decision possible for you to make. You will only understand things they are happening to you. Most of the time you will not be able to do that to. You can only decide by the general principle of good and bad. Like it is said in Bhagavad Gita you can only make right decision if you make decision on the basis of dharma which simply mean that decision is good for all in general. There is no clear cut guide line to make a better decision but the best thing that you can do is make them. Because delay making decision is sometime bad then making the wrong decision. 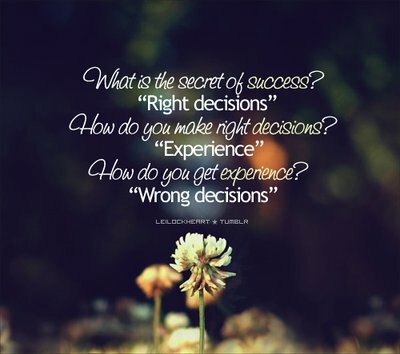 Because if you make a wrong decision then you can learn from it. But if you don’t make a decision at all then there is nothing for you learn. So what you can really do is make decision fast so that you can learn fast. You can not learn anything if you do not decide. All this thinking come from out fear of failure if we are afraid of our failure then there will be reason for us to make decision now. But because we are afraid of the reason that we can be wrong so what we do is not make decision at all. This also true with making art if your not will to make bad art at first because the art that you will make at first will be bad, then you will never be able to make good art, all you have do is keep making art. Do not stop because you think that it is not good right now. It will become better as you work but it will only get better if you work now. If you stop to work now then you will not make better art. Or to say better decision the person who can make better decision if only because he/ she have made a lot bad decision in past. So you can only make better decision by taking a lot of bad one. But that do not mean that you should take decision you think are wrong. You should always take the best decision that you can make at that time. If it appear at the later time that it was wrong then you analysis why it was wrong and what can you have done to make it better. We are not smart enough to analyse the decisions that you have made now. You lack experience and knowledge to make that call. But your subconscious have that power. So when sometime you have a feeling that you should do this and do not understand why. Just trust your instinct so if you that you will be better of with it so what I really want you to do is trust yourself. There is no other way to do that. And the only way by which you will be able to do that is if you do it for some times. And you take decision just based on your gut. And you will afterward that your gut was right. You start to trust your gut and start making better decisions in your life. Yes it will take some time to get used to but you can start to apply it and you will start to see results in your life. The first time it will be hardest so what you can do make small decision by your gut. For example what jam to eat just see at all the options and just select what your mind is telling you to. Do not analyse and try to understand why it is a better choice. Just trust your gut and carry on. It will take some practice for you to stop over thinking in that process but after doing that for some time and you will start to see that you are making better decisions without use of your conscious mind. What we all want to do is make better decision in our life but we can only do that if we trust out gut to make complicated decisions for us. You will be amazed by the results.